A Colombian man with a serious stomach illness had successful surgery on Tuesday, but says government rules means he has no idea who will pay for it. A Colombian man with a serious stomach illness had successful surgery on Tuesday, but he has no idea who will pay for it. Alejandro Giron, who had been only able to consume liquids since January, said before the surgery that the new federal rules concerning health care and refugees left him unsure about how the hospital bills would get paid. 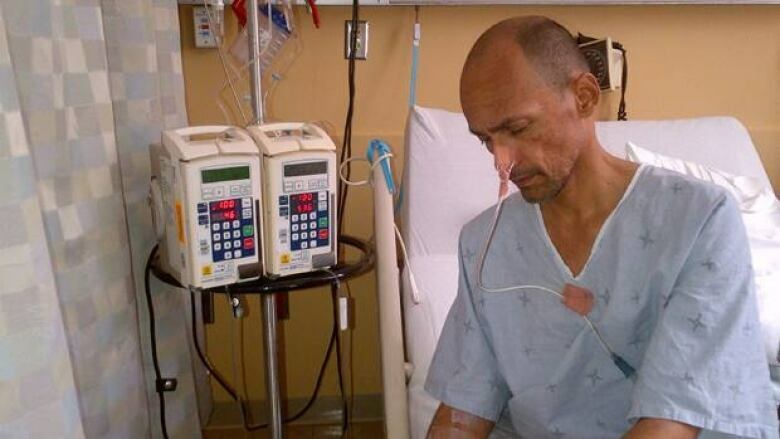 "I'm going to die," Giron said before the surgery at Toronto General Hospital. "Because [at] this moment, I cannot eat anymore." Physicians have told Giron's friends he needs a few weeks to recuperate, but that he'll now be able to lead a healthy life. Giron's illness involved his stomach and liver, and without surgery, his future was bleak. He had dropped from about 150 pounds to under 130 pounds. Giron has appealed to the Department of Citizenship and Immigration, but there has been no response. His doctors haven't said how much the surgery will cost him — yet. A fundraising effort was started online, but it has only brought in about $150. Francisco Garcia, Giron's friend and an elder from his church, says somehow they'll deal with the bills. "The most important thing is that Alejandro get well," he said. CBC News contacted the office of Ontario Health Minister Deb Matthews to inquire about how much the surgery could cost, but didn't receive a response. Thousands of refugee claimants had their extended health-care benefits cut off by Ottawa on Canada Day, and there remains confusion in both the refugee and medical communities regarding health-care coverage for refugee claimants. In this case, Citizenship and Immigration say they don't consider Giron a refugee. He arrived in Canada in October 2006, and his first claim for refugee protection was denied in June 2008. His request for a judicial review of that decision was also denied, said spokesperson Nancy Caron. Giron then applied on humanitarian and compassionate grounds, which was also denied. He is seeking a judicial review of that decision. "As a rejected refugee claimant, Mr. Giron’s costs would be covered through the Interim Federal Health Program only if the surgery was necessary to address a disease or condition that could pose a risk to public health or safety," Caron said in an email. On the fundraising website, it is stressed that Giron was healthy when he arrived in Canada, and he worked until he became ill.